New York & New Jersey (SCI), the not- for-profit organization, which provides spiritual personal and professional aid to the well-being of merchant mariners. Rev. Canon Larom instilled with new leadership by an experienced leader, who also happens to be the first woman to hold such a position at SCI. Director, Rev. Canon Peter Larom, (who will continue to function as a spe- cial adviser to the institute), SCI is ready to move into the next chapter of devel- opment through its new leader. Rev. Dr. 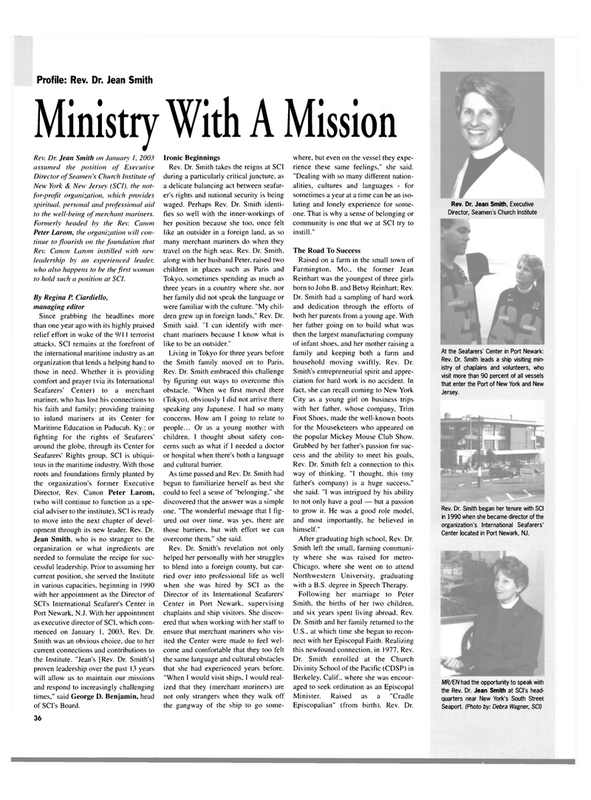 Port Newark, N.J. With her appointment as executive director of SCI, which com- menced on January 1, 2003, Rev. Dr.
Tokyo, sometimes spending as much as three years in a country where she. nor her family did not speak the language or were familiar with the culture. "My chil- dren grew up in foreign lands," Rev. Dr.
Smith said. "I can identify with mer- chant mariners because I know what is like to be an outsider." Rev. Dr. Smith embraced this challenge by figuring out ways to overcome this obstacle. "When we first moved there (Tokyo), obviously I did not arrive there speaking any Japanese. I had so many concerns. How am I going to relate to people... Or as a young mother with children. I thought about safety con- cerns such as what if I needed a doctor or hospital when there's both a language and cultural barrier. As time passed and Rev. Dr. Smith had begun to familiarize herself as best she could to feel a sense of "belonging," she discovered that the answer was a simple one. "The wonderful message that I fig- ured out over time, was yes, there are those barriers, but with effort we can overcome them," she said. Center in Port Newark, supervising chaplains and ship visitors. She discov- ered that when working with her staff to ensure that merchant mariners who vis- ited the Center were made to feel wel- come and comfortable that they too felt the same language and cultural obstacles that she had experienced years before. "When I would visit ships, I would real- ized that they (merchant mariners) are not only strangers when they walk off the gangway of the ship to go some- where, but even on the vessel they expe- rience these same feelings," she said. "Dealing with so many different nation- alities, cultures and languages - for sometimes a year at a time can be an iso- lating and lonely experience for some- one. That is why a sense of belonging or community is one that we at SCI try to instill." Reinhart was the youngest of three girls born to John B. and Betsy Reinhart; Rev. Dr. Smith had a sampling of hard work and dedication through the efforts of both her parents from a young age. With her father going on to build what was then the largest manufacturing company of infant shoes, and her mother raising a family and keeping both a farm and household moving swiftly. Rev. Dr. Foot Shoes, made the well-known boots for the Mouseketeers who appeared on the popular Mickey Mouse Club Show. Rev. Dr. Smith felt a connection to this way of thinking. "I thought, this (my father's company) is a huge success," she said. "I was intrigued by his ability to not only have a goal — but a passion to grow it. He was a good role model, and most importantly, he believed in himself." After graduating high school, Rev. Dr.
Northwestern University, graduating with a B.S. degree in Speech Therapy. Smith, the births of her two children, and six years spent living abroad. Rev. U.S.. at which time she began to recon- nect with her Episcopal Faith. Realizing this newfound connection, in 1977. Rev. Episcopalian" (from birth). Rev. Dr.
Center located in Port Newark, NJ.